I Met My Book-Based 2017 New Years Resolution! – on my way: make it someday. I Met My Book-Based 2017 New Years Resolution! 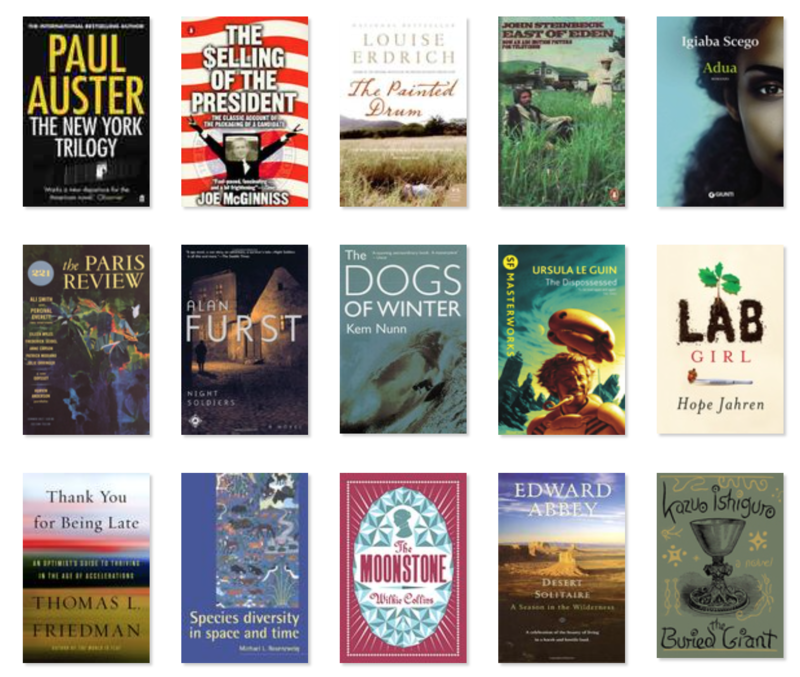 Last year, I made a resolution to try to read more. I did it because I really love reading, but I realized that I wasn’t doing so much of it outside of work. I wanted my New Years resolution not to be something that was a responsibility or a chore, but something that would increase the time I spent doing something that I liked. Something that would improve my quality of life and bring me some happiness. 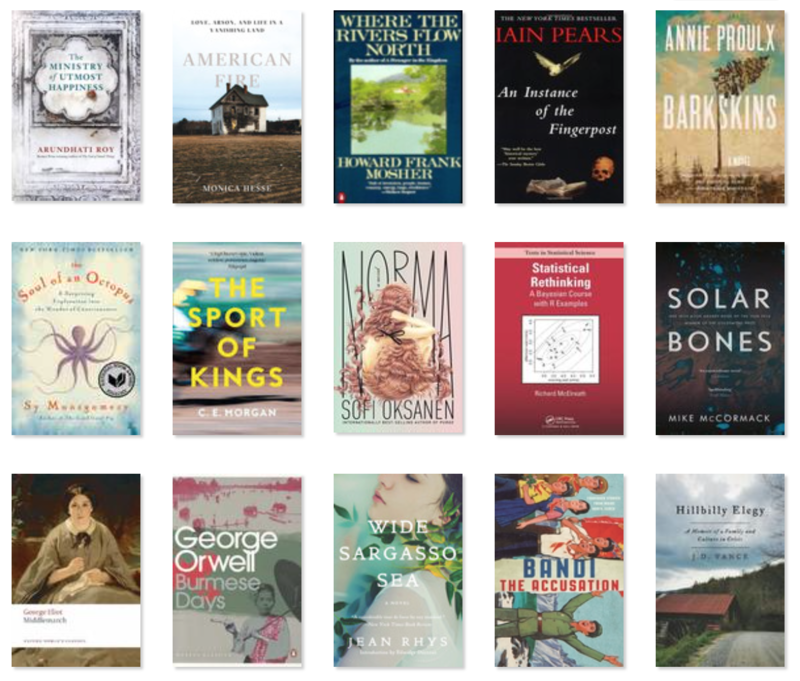 So: I resolved to read 52 books. One a week. And, dear reader, I did it! This might be the first time that I can say I hands-down nailed a resolution and kept it going all year long. I read 20,300 pages in print, aside from papers read for work or things read online (which is a lot; after all, one of the reasons for this resolution was to spend less time staring at a screen, but I still have a lot of screen time!). and why my resolution this year will be to read even more diverse authors. 13 books were received as gifts from various people (mostly my parents, but also friends), plus The Moonstone which was received in the book exchange (most of the other book exchange books I had read the previous year). One book (The Haywire Heart) was sent to me by a publisher asking for a review. A few I chose because they were classics (East of Eden) or at least, classics for a particular crowd (The Selling of the President, Wide Sargasso Sea, Desert Solitaire), which I had never read. Some I picked up off my parents’ bookshelf when I was home (The Painted Drum, East of Eden, Cod). Others were recommended to be by friends (Burmese Days, Where the Rivers Flow North, Outlander, Solar Bones). One I picked up from a bookshelf at Powells which highlighted their selection of women authors in translation (Adua). 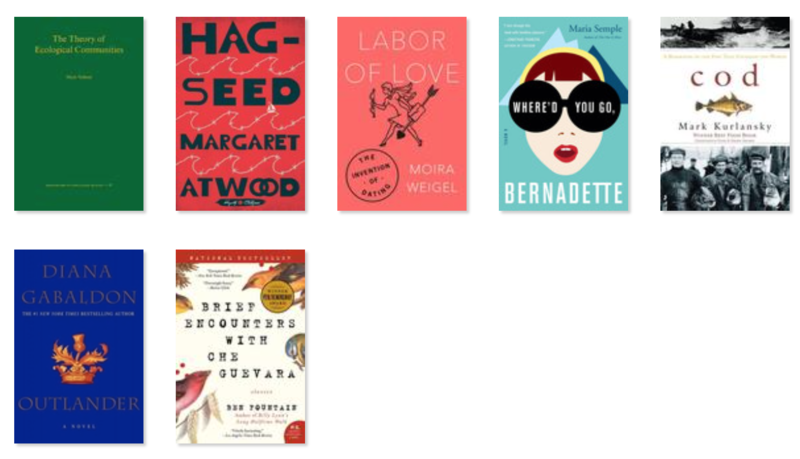 Some I picked because I loved previous works from the authors (The Unconsoled, The Buried Giant, The Dispossessed). And most of the rest I chose because they were award winners, I had read reviews of them, or they were parts of various lists that I saw. I read a lot of books that were either gifts or recommended to me by friends. They were mostly excellent. I found Thank You For Being Late a bit long – there were sections that I found really interesting and inspiring, and long sections which seemed tedious. Solar Bones I did not find as magical as some other people did, but, again, there were entire sections which were amazing – and as a feat of writing it is stylistically a marvel. If you can’t think of what to read, definitely ask friends for recommendations. You’ll get out of your rut and find some amazing stuff. Of the work-related books, four were chosen myself and three were chosen for me, either as part of our research group’s book club or because one was a “gift” of my boss (probably a signal I should read it…). In my spreadsheet, I kept track of some basic data about the books and authors I was reading. I was going to make some nice R ggplot graphics of this data, but I’m just way too tired. So I’ll describe the data verbally instead. Of the seven work-related books, all the authors were white men. Sigh. Leaving out those as well as the two literary journal issues (which featured writing by men and women, and of various nationalities), I read three short-story collections, 29 novels, and 13 nonfiction books. 29 books were published since the year 2000, with BY FAR the biggest year being 2016 (11 books). I’m ready new writing, for the most part. The earliest books were The Moonstone (1868) and Middlemarch (1871), with a big jump until Burmese Days (1934) and then East of Eden (1952). 25 books were by men, and 19 by women. The disparity really comes on the nonfiction side: with novels and short stories combined, 16 books were by men and 15 by women. 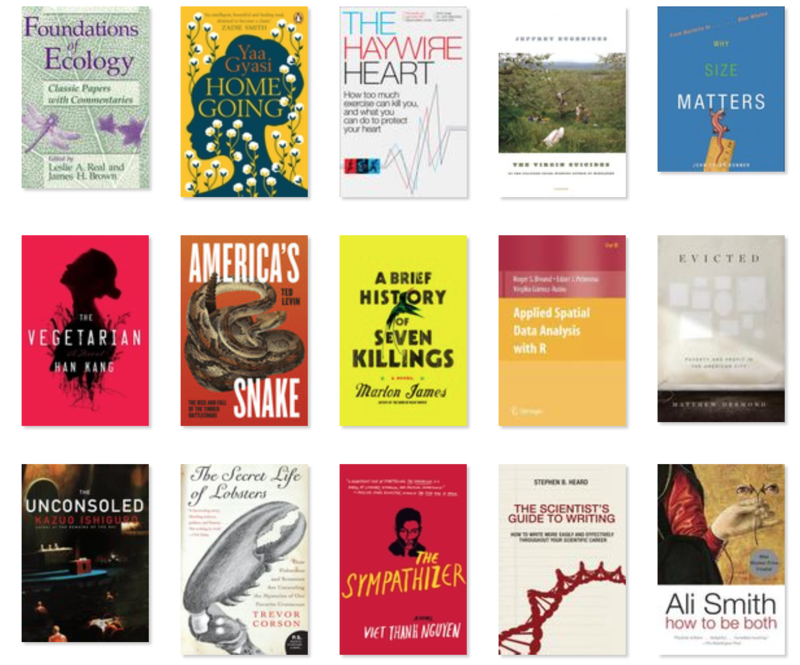 For nonfiction, nine books were by men and four by women. 11 books were by non-white authors – and interestingly, it was 5 by men (20% of the total number of male authors) and 6 by women (32% of the female authors). 28 authors were American, of which at least two were born outside the country (Viet Thanh Nguyen in Vietnam and Yaa Gyasi in Ghana). 7 authors were British, of which at least two were born out of the country (Jean Rhys in Dominica and Kazuo Ishiguro in Japan). The other authors are one each from Finland, India, Ireland, Canada, Jamaica, North Korea, and South Korea, and Ideaga Scebo is Somali-Italian. Most of the works take place completely or partly in the country of the author’s origin. 4 books were translations: Adua (from Italian), Norma (from Finnish), The Vegetarian (from Korean), and The Accusationhow the translation process helped verify that it is an authentic North Korean work (from Korean, and you should read about ). I found this year of reading so rewarding! A few close friends almost made fun of me for how voraciously I was reading, but I learned so much, and learned to think about things in a different way, even if sometimes only temporarily. I also fairly frequently read on the bus or tram to work, which is a big improvement over reading about politics on Twitter and getting mad. I read a lot of fiction, and I read a fair amount of work that is set somewhere else, maybe in the future or the past, and some that involves magic. I do read some nonfiction to learn, but a huge aspect of my current love of reading is to be transported somewhere away from work and my daily life. And I think that spending more time in these other universes imagined by some fantastic writers has, indeed, improved my outlook on things and my balance. More generally, this resolution reminded me how important it is to make space for things you love to do. Maybe that isn’t reading for you, but think of something that is and that you find yourself not doing as often as you used to or as you’d like to. Try to make a habit to carve out a little bit of space for it. We spend a lot of time doing things that just make us tired and frustrated and aren’t helping us out (hi, Twitter…). Eliminating those habits completely is not a realistic goal. But trying to replace them some portion of that time with a different thing that makes you happy is both realistic and more likely to succeed than simply resolving to NOT do something. This year, I’m going to make more of an effort to read a better balance of male and female authors, and more books that aren’t by Americans. Although that’s hard, because there are so many good books by Americans. I’d also like to read more translated work. We’ll see how that goes. ← Haute Savoie and the Best World Cup Yet?